Tender Coconut water, is the second best thing offered by nature, next to water. Back in India, every bus stop,train station will have a cart-vendor selling them any time of the year. I remember having them for Rs.10 and now they sell for Rs.40,sometimes even Rs.50. We had 4 coconut trees in our old house, back in Wallajah, a place near vellore. Appa built us a washing stone, next to it, as me and sister wanted one to sit and brush our teeth, every morning, enjoying the nature. It was heaven on earth, my brother used to have fresh coconut water, everyday straight from the tree. But later, due to some reasons, we had to sell that house and move to Chennai, life at the fast phase, we buy tender-coconut from street vendors. 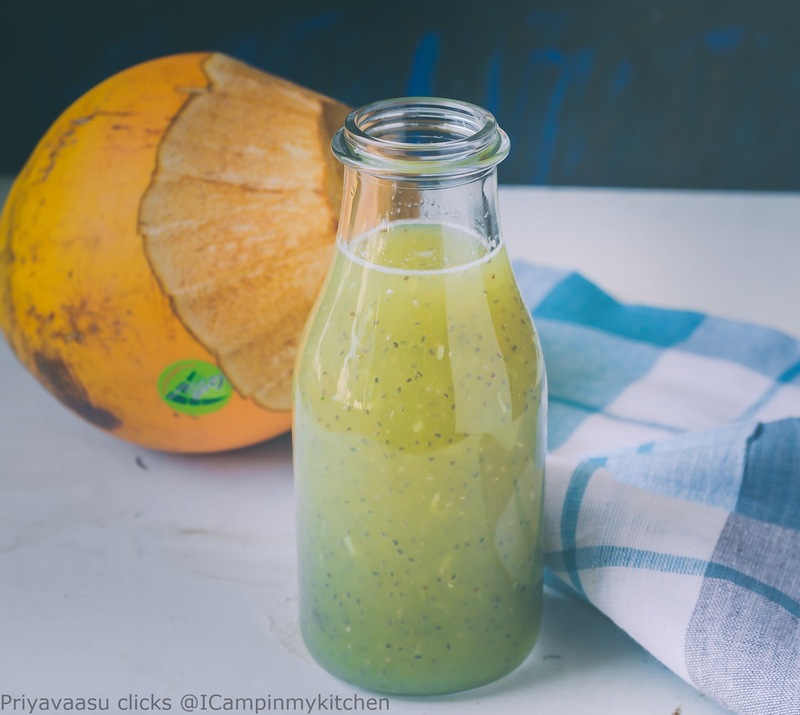 Ok, coming to today's recipe, a refreshing drink with tender coconut and fresh grapes. I have added lemon juice and ginger for that extra zing, it is purely optional, but i highly recommend them both. I would definitely make this as a welcome drink for my dinner/lunch parties. Serve it chill, and enjoy the freshness. 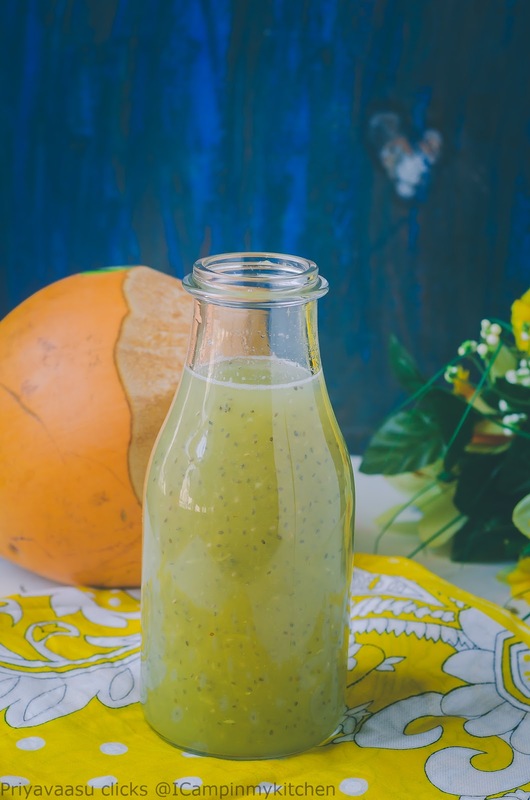 Transfer the tender coconut water to a serving glass and refrigerate for 20 minutes.This helps the smoothie to be chill. Take 1/4 cup of tender coconut water in a small cup and soak the chia seeds for 10 minutes. 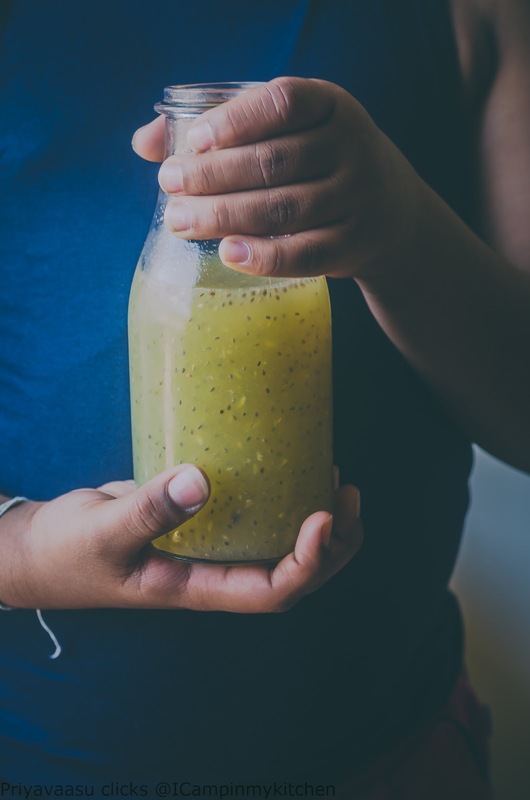 In a blender take green grapes and remaining tender coconut water and blend until smooth. Strain the smoothie using a strainer to remove the grape skin. To this add chia seeds soaked water, ginger and lemon juice. Give a good stir. Serve immediately. I am trying to figure out in my head how these unique combination of ingredients must have tasted. I am sure it was yummy besides being healthy. Such an ultimate drink, seriously this drink is something i definitely want to give a try. Awesome combination of coconut water, chia and grapes. And the snaps are so beautiful.. Wonderful combination and the addition of ginger gives a nice punch to the smoothie.Got a lot color. cool refreshing drinks. Love the clicks. Coconut water is a excellent substitute to water to make drinks . I am loving this combo. Lovely combination. I am amazed at the various combination of smoothies you are coming up with. That is an amazing combination. What a refreshing drink Priya. That last click is amazing. Such a perfect drink Priya!! Would love this one. Perfect drink. I will love it will use kiwis to make it as there are no grapes right now. The drinks looks very refreshing. The last pic is wonderful. The combination and the clicks are stunning Priya..classic touch!